Brown sugar, cinnamon and nutty, rich cashews are rolled into tight baklava cigars in this eminently snackable dessert. 1. Heat the panggangan to 350°. In a food processor, combine 6 tablespoons butter with the cashews, brown sugar, cinnamon, and salt and pulse until the filling is finely chopped. 2. 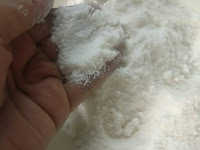 In a small saucepan, combine the granulated sugar with 1⁄4 cup water. Bring to a boil and cook, stirring, until the sugar dissolves, about 2 minutes. Remove the syrup from the heat, stir in the lemon zest and juice, and let stand for 15 minutes. Pour the lemon syrup through a fine sieve into a glass measuring cup and let cool; discard the zest. 3. Grease an 8-inch square metal baking pan with some of the remaining melted butter. On a work surface, lay 1 sheet of phyllo dough so the short sides are parallel to you. Brush the sheet with some butter and place the second sheet over the first. Brush the phyllo with butter and cover with the third sheet. Brush the last phyllo sheet with butter, cut the phyllo stack in half lengthwise, and then cut each rectangle crosswise into 5 equal small rectangles. Arrange 2 tablespoons of the cashew filling in a line along the long edge of 1 of the phyllo rectangles. Roll the phyllo around the filling into a log and place the log in the prepared baking pan. Repeat with the remaining filling and phyllo rectangles to make 9 more logs, arranging each log against the others so they fit snuggly in a single layer in the pan. 4. Brush the remaining melted butter over the top of the logs and bake until light brown and crisp, about 35 minutes. Remove the baking pan from the oven, pour the cooled syrup over the baklava logs, and let cool to room temperature. Invert each log and let stand for 15 minutes to allow the syrup to redistribute itself in the logs before serving.